Micro Plastics has added a new line to their inventory of 250 million parts! The Phillips Pan Machine Screws are molded in tough, resilient, and corrosion-resistant Nylon 6/6 material. Thread sizes included are: 4-40, 6-32, 8-32, 10-32, 1/4-20 and 1/4-28. Available in 25 standard lengths ranging from 3/32 in. up to 3 in., Micro Plastics also offers an extensive line of machine screws, including head styles such as Binder, Binder Combination, Fillister, Hex, Pan, Round, Socket, Flat, Oval, and Thumb Screws, as well as Studs, Grubs, and Flat Head Wing Screws. Gates offers a broad range of design products for both basic and complex power transmission drives. Design a two-point drive from scratch, or modify an existing drive integrating Gates technology, with free Design Flex® Pro™ software. For multi-point drives try Design IQ®. All Gates tools are backed by product application engineers available to collaborate on unique design solutions. For more information, visit http://gates.com/ptdesign. Shell is using simulation to find and optimize the right lubricants in complex friction problems. If you're wondering about the load capacity, speed and rotation, vibration absorption, temperature, and price of sliding slewing ring bearings, look no further. These low-cost replacements for expensive roller bearings may be just the ticket for your latest mechanical challenge. DENSO Corporation has developed a Cold Storage (CS) Evaporator that limits the increase in vehicle cabin temperature during an idle stop when stop/start technology is employed. 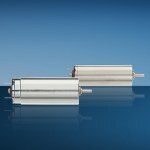 SKF CASM Series servo actuators are ideal electromechanical solutions for applications historically performed by conventional pneumatic cylinders. This technology, in comparison, inherently reduces energy consumption, potential contamination, noise, and maintenance, while eliminating the need for constantly running compressors, hoses, and other components associated with pneumatic cylinders. 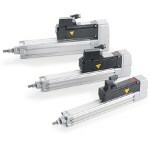 All three modular models (CASM-32, CASM-40, and CASM-63) have been designed to fit standard industry footprints of pneumatic cylinders and can easily facilitate system conversion. Motor adapter kits enable users to connect the motor package of their choice and easily program motor profiles. Load capacities range from 300 N to 5,400 N, stroke lengths range from 50 mm to 800 mm, and speeds from 60 mm/s to 1,060 mm/s can be achieved. 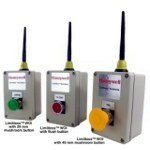 Honeywell's Limitless Wireless Operator Interface is a controller designed to wirelessly turn on and off equipment (pumps, motors, drives, conveyors, and other industrial equipment), open or close gates/doors, or provide notification to remote locations. This unit, which provides up to a 1,000-ft line-of-sight communication range, can be used in rugged industrial environments to notify appropriate departments when there are quality, machine, material out-of-stock, or other manufacturing issues. Limitless receivers provide PLC inputs or relay outputs connected directly to equipment. 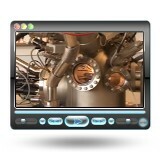 Advanced power management technology prolongs battery life. 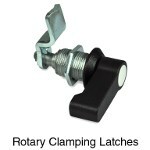 GN 516 Rotary Clamping Latches from J.W. Winco have a closing mechanism that transfers the rotary movement of the operating element (key) into a 90-degree turn and then into a 6-mm linear stroke. This mechanism is designed for common applications such as making a tight and vibration-proof interlock in the end position (retaining position) in connection with an elastic element (door/casing seal). The lock housing is zinc die-cast, and the locating ring is zinc die-cast and plastic coated with a black textured finish. The latch is zinc-plated, blue passivated steel. Seven types of operating elements are offered. This component is offered in metric sizes. MICROMO's range of brushed motors has expanded with the addition of two new graphite commutated motors. The CXR series motors feature premium materials. The new drives offer the benefits of a high power density with dynamic 4- or 8-mNm continuous output torque and an extremely flat gradient of the n/M curve. Featuring compact dimensions of 13- or 17-mm diameter and a length of 36 or 41 mm, as well as a large operating temperature range of -30 to 100 degrees C, the 1336 and 1741 are suitable for a wide range of applications. Both motor variants can optionally be combined with two-channel encoders and a compatible range of precision gearheads. Speed control or positioning tasks are managed either by the FAULHABER Speed Controller SC 1801 or the Motion Controller MCDC 3002. Using EOS direct metal laser sintering, Morris Technologies shows how extreme customization can team up with extreme sports so that climber C.J. Howard can scale new heights with his one-of-a-kind titanium prosthetic foot. New car owners of the near future might yell, "What the beep?!" when they try to pound their horns. Georgia Tech researchers have developed a self-charging power cell that directly converts mechanical energy to chemical energy, storing the power until it is released as electrical current. The advance could have military applications for troops who might one day recharge battery-powered equipment as they walk. NASA engineers are using 3D printing to build a next-generation, two-person rover to support humans exploring other worlds, such as asteroids and Mars. 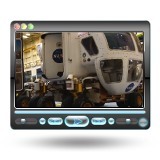 Designers of the galactic SUV used fused deposition modeling (FDM) technology from Stratasys to create one-off, working prototype parts quickly and efficiently.